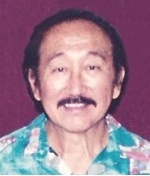 John Sur, Jr. of Kaneohe passed away on October 1, 2018. He was born on February 19, 1931. He graduated from Farrington High School in 1949, then served 6 years in the U.S. Army. He retired from Hawaiian Telephone Co. after 36 years of service. He is survived by his wife of 66 years, Gloria (Takiguchi), daughters; Valerie Tsutsumi, Debbie Sur, Jennifer Sur-Watanabe (Dean), Cynthia Coleman and Natalie Sur, 9 grandchildren and 3 great- grandchildren, brother, Harlan (Carolyn). Services @ Mililani Memorial Park and Mortuary Downtown (20 S. Kukui St.) on Saturday December 8, 2018, visitation at 10:00 a.m. followed by a celebration of life at 11:00.